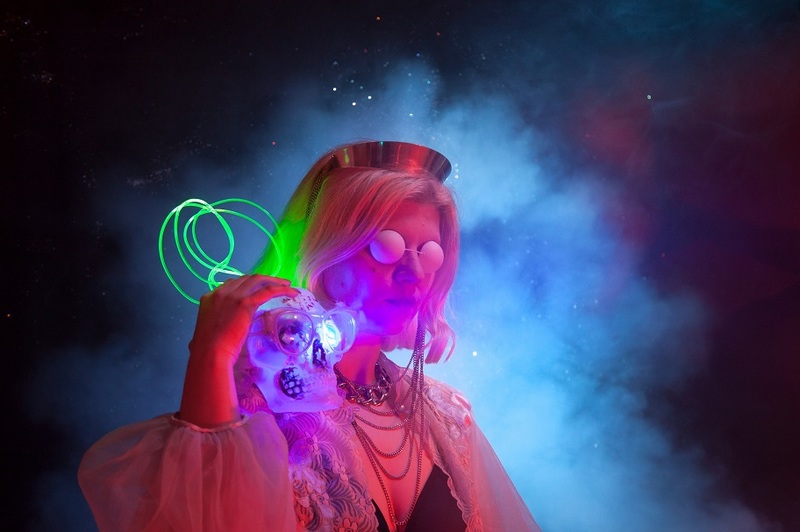 Berlin's consciousness expanding pop lord Mary Ocher; photographed by Boris Eldagsen. Natural Velvet captured in pink; photographed by Missy Malouff. Having recently caught up with Natural Velvet in a discussion of their Friends Records release Mirror To Make You, we now present the world premiere for the Delaney Cate & Brendan Finnerty video for “Gazed Upon”. A riotous song that rails against short-cited perceptions & the gazes of dubious intent is given a vibrant performance show installation treatment. Filmed at the Ottobar with lighting arrangements by Michael Chappell & three-dimensional animations supplied by Ryland Bishop; Kim Te, Spike Arreaga, Corynne Ostermann & Greg Hatem unleash a video that is the ultimate Natural Velvet live experience that is meant to be observed at the highest definition possible (and played at the loudest possible volume—naturally). Natural Velvet commence “Gazed Upon” with pure ferocity as an abundance of polychrome beams of blazing luminance break out of every corner & section of the frame. The Velvets send a gaze of light that shines back to their adoring audience where their performance art piece is peppered with CGI images of roses, hearts, hands & other glimmering symbols of affection. The band fashions their energy to roar with an unharnessed nature where guitars are sharpened to be shaped like a towering presence of strongholds commandeered by the Natural Velvet battalion. An assertive sound & message that wards off infantile desires & questionable connections; Kim, Corynne, Spike & Greg counter the passing glances with a world-ripping sound & prominent visuals that cannot be ignored. This ain’t your parents’ Pink Floyd light show, this is a Baltimore band of enlightened upstarts showing the rest of the world how a performance is done. The array of blaring stage-lights & the unrelenting flashing & thrashing chord mathematic-dynamics create a whole kind of calculus that obliterates the binary construct of the cis male gaze by exalting the infinite power of the femme eternal. Natural Velvet’s visuals for “Gazed Upon” unleashes a mighty artistic display of volition that stands strongly with everyone that has ever identified outside of the two party system of sexuality & personality. The band makes a stand for a more inclusive approach & outlook on humanity by singing strongly, while wielding fierce electrically-charged axes with an aesthetic to be both feared & love at the same time. Describe the process of creating the live performance light show for the “Gazed Upon” visual. We had a specific vision for the record release show for Mirror To Make You and which you can see in the live footage in the video. We then replicated the same installation in the studio for further footage. We were lucky to work with artist Delaney Cate, who was able to synthesize our desire for sparkly disco queer goodness with that of an amoeba quality that made the room vibrate and shimmer during the show. Getting to make the installation was such an exciting creative adventure! The installation stretched something like 100 feet on the ceiling of the Ottobar, where we held the show. We knew we had to recreate the energy and refracting light for the studio shots using the same backdrop, otherwise they wouldn’t have the same visual weight. We then reached out to lighting designer Michael Chappell to create a custom light show that encapsulated all the aesthetic concepts we wanted to work with, and that would be really fun to be immersed in live. Lighting designer Jack Thomas picked up the reins for the studio shots and intentionally crafted a light show to fit with the installation by Delaney Cate. We were also blessed to work with 3-D animator Ryland Bishop, who created a response animation to the installation by Delaney Cate, and the light show from the Ottobar. Ultimately, our goal was to really transform the space we were given and to create a unique and standout experience, both live and on video. Many people reached out to us after the show and said they felt transported and hadn’t seen a show like it—we’re hoping for similar with the video. Getting to know Baltimore’s Natural Velvet; photographed by Kevin Granger. What is it about the idolatry & fixated obsessions that we have as both artists & fans in our fascination with our favorite artists & the craft of stage performance? It’s truly interesting; we as a band are obsessed with the nature of musical performance and being both the viewer and the performer under the gaze of others—you can see that dichotomy in our single from last year, the Britney Spears cover of “Gimme More”, and lots of our work in general. We think about the Gaze a lot, as women and queer people in a performance and visual-based medium. The Gaze holds a lot of power, and by either inviting it or rejecting it—or any combination therein—you can harness power that becomes your own and that you can wield in interesting ways as an artist. In this case, we’re also interested in the sort of musical simulacrum of performing your heroes, by taking elements of their personality, craft, or whatever and incorporating it into your own art. Most artists do this to some degree. It’s interesting to see what people are inspired by and how they want to carve their careers out, based on the examples lead by people before, based on what their perception of their heroes is. It’s all very personal, the subject-object relationship. We were lucky to work with director Brendan Finnerty who understood these nuances of the imagery and helped us visually straddle the line, in terms of the Gaze of the camera, or the person looking back at you in the video. Corynne (of Natural Velvet) co-directed, so it’s interesting in that you can see the non-reality vs. the reality of the shots, and the shifting gaze of the video throughout—she both looks at the camera and owns it, and away, as an object to be viewed, and the lyrics reference this, as well. Further insights on how you all are moved and inspired from the making of the Mirror to Make You album? Seeing the response from our community and from the DIY music community as a whole has been really cool. It’s really special to get to be in a really loud female-fronted band that’s not afraid to be angry and to have some fun—in a year that hearkened to some of the prettiest, softest pop guitar music in a while (2017), it’s always fun to have made an uncontrolled, wild record. We’re so grateful for all the opportunities we were afforded because of this record—getting to record with a legend (Martin Bisi), getting to play Hopscotch & U+N Fest, etc. Basking in the sunlight’s glow with Natural Velvet; photographed by Micah E. Wood. What can you all tell us about what’s next in the creative cards for Natural Velvet? Gurl, we’re always hustling! We’ve got a giant tour ahead of us, our biggest one yet, and we’re leaving the country as a band for the first time, to play in Canada, starting the first week of March. We’re finishing up writing another full-length record, (because of course we are), and we’re in the process of sourcing where we want to record that, with whom, and what kind of budget we’re talking about here. We want to really expand what we’re doing, tour & promote smarter, and meet and play with some excellent bands and friends. Further insights & notes from the Bmore scene? Corynne recently finished art-directing Micah E. Wood’s next music video, and is pumped to make more visual output for other musicians with further upcoming projects. We’re super psyched about Balti Gurls & Blush & Brew’s events, on the whole. Purrer via Amanda Glasser is REALLY, REALLY good, and that lineup is killer! We’re excited for painting and arts come-up regarding Amy Sherald’s portrait of Michelle Obama, that portrait is the first person of color’s artwork in the National Gallery, along with Kehinde Wiley. We are pumped for our buds in Post Pink, who are getting to tour with the Breeders, like holy cow. Finally, we are really excited about the prospect of Ratboiler’s return to Baltimore. What is currently inspiring you all right now in this long & drawn out winter? Corynne is SHITTING herself over the idea of a new Robyn record, and is reading a whole lot of books—just picked up a Jackson Mac Low anthology that looks really promising. Spike has been curating a reoccurring event called “The Future In The West” that we’re all really excited about. We are all dying over Drag Race, as per usual, and looking up cool weird and alternative drag—Harsh Noise Beat Face out of Brooklyn is an event that’s super cool that we’ve all been following. Oddly, we’re excited for the future of music. What do you all feel are some of the most important areas of activism on both local, national & international levels right now? The Baltimore Gun Trace Task Force trials are insane, if you really think about it—the feds are just now dipping their toes into the organized crime syndicate that is basically the Baltimore Police Force. It’s amazing to watch, and it’s amazing it’s not getting the attention that it deserves in the news—we’ve got this angry orange president mocking dead children survivors from school shootings taking up the space. Baltimore Beat is doing some seriously great reporting on the BCPD that we are all soaking up. Inside insights from Natural Velvet; photographed by Micah E. Wood. The Baltimore Cease Fire was huge, too. 12 days of no homicides!! That’s huge! Shout out to Erricka Bridgeford for organizing this grassroots campaign. On the national level, right now there is a real and active conversation about violence in our communities and in America as a whole—violence as in the #metoo movement, the Black Lives Matter movement, the Baltimore Cease Fire, and the Gun Control conversation as sprung up by the shooting in Parkland Florida—people are having real and important conversations about violence in our society, to change the conversation from a body count to a lost life, a lost friend or family member, etc. That is HUGE. We need to continue this momentum and save lives, careers, emotional well-beings, etc. We are very hopeful for the future. We’re all so excited to record a new record, and Corynne applied to a whole bunch of painting residencies she’s excited about. On the whole, we’re dreaming of going to the Korean Spa, swimming in the ocean, never coming back from tour and somehow miraculously not dying of starvation or exposure. Tips for surviving winter & 2018 as a whole? Corynne recommends baths—bath salts & bath oils, no bath bombs, and certainly no bubbles and paying your water bill on time. Kim recommends checking out of winter by going crazy trying to book a tour. Spike recommends taking a lot of zinc & calling your parents. Greg recommends vacation and king size beds all to yourself, if you can. We as a whole recommend caring about each other and being kind to yourself. Natural Velvet’s new album Mirror To Make You is available now from Friends Records.